Start your 4-hour urban adventure through San Francisco with hotel pickup, and hop aboard a custom-made, open-air vehicle that provides views of the city’s historical and architectural highlights. This quirky 4-hour tour combines visits to notable landmarks with off-the-beaten-path stops at interesting alleys, murals and movie locations. As you traverse the city, listen to your entertaining guide share insightful and humorous facts. Marvel at Twin Peaks, gawk at the art deco towers of the Golden Gate Bridge, and meander through Golden Gate Park and the diverse neighborhoods of San Francisco. You'll recognize scenes from movies like Hitchcock's Vertigo, find hidden artwork and discover some secrets unknown to even locals. In addition, this memorable tour includes stops at any events happening that day. After sightseeing, you’re dropped off at Pier 33 for the 15-minute ferry ride to Alcatraz Island. 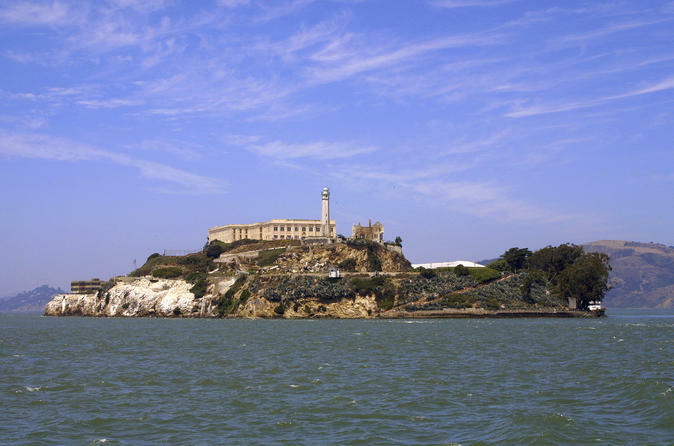 When you land on ‘the Rock,’ receive a brief history of Alcatraz before heading into the cell block to learn about the former federal prison, which operated here from 1934 to 1963. Alcatraz is a self-guided activity using the provided audio tour 'Doing Time' — just slip on your headphones and listen to real interviews from former inmates and guards. Expect to spend up to 2.5 hours with the audio tour; you can explore the prison grounds and stay as long as you wish before hopping back on the ferry to return to San Francisco’s Pier 33, where your tour ends (ferry departs every 30-40 minutes).